Otley Science Festival is set to develop even more fun and fascinating activities for young people as The Grammar School at Leeds (GSAL) is announced as a new sponsor. The week-long Otley Science Festival has run at Otley Courthouse every November since 2008, drawing in a wide audience from schools and the general public. An extensive range of events offers something for everyone, whether families, students or professionals. Festival events include science shows for pupils during the school day, and informative and entertaining evening and lunchtime sessions. The Otley Science Fair is the week’s grand finale, bringing together organisations from Yorkshire and beyond to show off the best of hands-on science. The festival relies on partnerships with local organisations to continue developing its programme and meet its goals, including engaging children with science and encouraging them to explore related career options. With expert scientists among its staff and alumni, GSAL is well-placed to deliver exciting demonstrations and engaging activities for science-loving young people. As part of their sponsorship, GSAL will be providing free transport to local partner primary schools to enable pupils to attend festival events during the week. Otley Science Festival runs from 11 to 16 November 2019, with the showcase Otley Science Fair taking place between 10am and 4pm on Saturday 16 November. The full programme will be published in late summer. 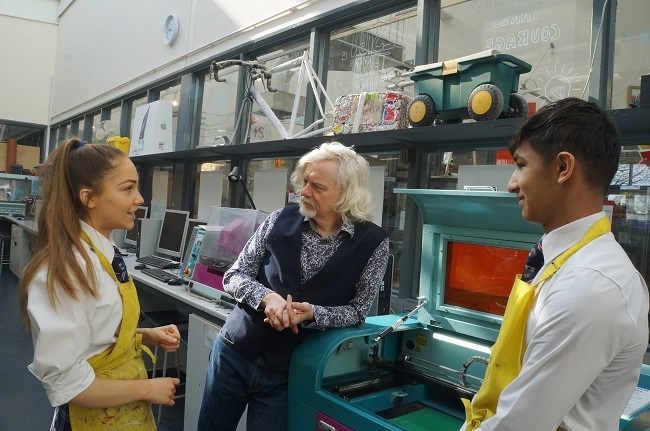 Photo: Year 10 students Zuzu Borland (left) and Faris Khan (right) show Marty Jopson the laser cutter during his visit to the design technology workshop at GSAL.